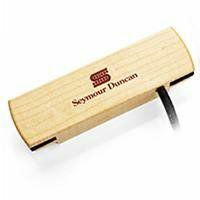 Seymour Duncan offers three choices in the Woody Series, but all have the commonality of instant mounting and unmounting, along with a great-looking maple cover that will look unobtrusively fantastic on your guitar. More importantly, if you already love the sound of your acoustic, the Woody Series will passively amplify your sound without anything to detract from it. Especially great for singer-songwriters and folk strummers, the Woody Series offer a moderate response that gives you plenty of amplification while allowing your guitar to blend nicely with vocals and other instruments. 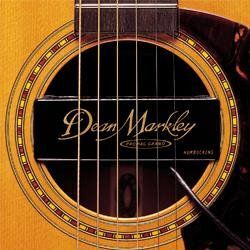 The Woody pickup fits any acoustic guitar with a sound hole diameter of 3.85 to 4.10 inches. They're also priced to fit the budgets of most musicians, and are a much more affordable alternative to buying a mic for acoustic amplification. Developed for studio recording and live performance with crystal clear, transparent sound. 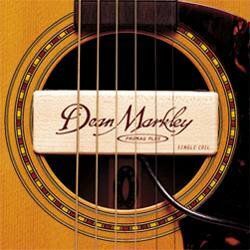 Dean Markley’s Pro Mag Grand pickup features a patented design that has the widest possible range of tones… warm full bass, smooth midrange, crystal clear highs, and the most brilliant harmonics you’ve ever heard. 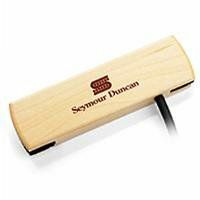 Made in the U.S.A. with easy 60-second instant-mount installation, this completely silent, humless humbucking pickup comes with a real maple wood housing with an ebony finish. 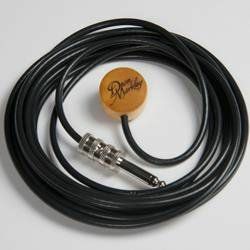 Includes a 13’ cable with a 1/4” end that goes directly from the pickup to your amp or PA.